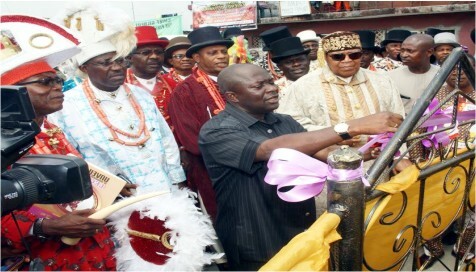 The Authorities of Andoni Local Government Council have admonished the traditional institution in the area to work in synergy for the upliftment, peace, unity and development of both the institution and entire kingdom of Obolo, noting that harmonious relationship in the traditional institution would speedily facilitate the development of the area. The agog capital city of Ngo town, headquarters of Andoni LGA on Saturday 25th February, 2017 was at the instant of the Chairman, Caretaker Committee, Chief Allen Jonah Abbi (JP) who convoked an extra ordinary meeting of the traditional institution with the sole aim of unifying the trouble institution for the speedily development of the local government area. 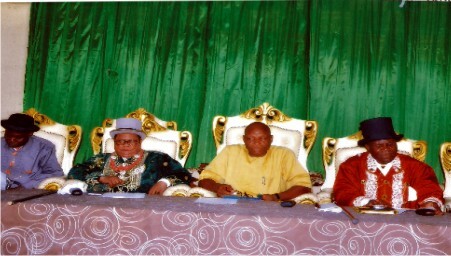 In a coincise four pages address to the traditional institution, the Chairman, Caretaker Committee, Chief Allen Jonah Abbi (JP) called on the Traditional Rulers and Chiefs to allow for peace, unity and development of the Traditional Institution and Andoni in general, appealing for collaboration and harmonious relationship for the interest of posterity. “Your Majesties, like I said earlier, my overall interest for the institution is peace, unity and development, hence my only and humble appeal is for you to give consideration for the trio of Unity, Peace and development to thrive, which in turn would fast track the needed positions that eluded us as a people years ago. It ismy submission that the institution must operate under one council as required by the extant law”. The chairman stated. Recalled how unity, peace and harmonious relationship existed in the traditional institution before the year 2000, the Council boss however, appealed for the immediate consideration of peace and unity of the institution to usher in development, adding that his sole interest in convening the meeting was the unity, peace, progress and development of the old institution and Andoni in general. The Andoni number one citizen who on behalf of the council and entire good people of Andoni LGA congratulated His Majesty King Aaron Miller Ikuru, Ikwut VII Okaan-Ama of Ikuru Town and His Majesty King Job William Okuruket-Nnabiget XIV, Okaan-Ama of Ngo Town on their recognitions and elevations as first Class traditional rulers, while citing the Rivers State Traditional Ruler’s Law No. 4 of 2015, called on them to immediately consider within three weeks a possible way of constituting a Council with an operational policies aimed at uniting the institution in tandem with the law for the overall good and development of the LGA. Meanwhile, that address of the Council Chairman elicited several positive reactions from the physically elated Traditional Rulers and Chiefs who through a motion moved and seconded by Chief Dan. J. N. Nsan and his highness Ubon J. G. Minini-Oyo for the acceptance of the address as a working document, since it is in cohesion with the law unanimously in a voice vote adopted the chairman’s address. Responding to the address after several inspiring contributions from the Chiefs, His Majesty King Aaron Miller Ikuru, Ikwut VII Okaan-Ama of Ikuru-Town on behalf of the traditional institution assured the Andoni Council boss of the chiefs readiness to collaborate for the needed peace and unity of purpose, noting that peace is not only a necessity but sacrosanct for Andoni development. However, a statement by the Press Officer to the Council Chairman, James, Mgboneme –Owaji indicated that the meeting was conducted in the Obolo dialect and was generally peaceful with over 200 Chiefs in attendance. According to the statement, His Majesty King Aaron Miller Ikuru, Ikwut VII Okaan-Ama of Ikuru Town, His Majesty King Job Williams Okuruket-Nnabiget XIV Okaan-Ama of Ngo Town and His Majesty King Isreal Uzamandeng Otuo X Okaan-Ama of Unyeada were present in the meeting.